This is a very special Halloween premier of this new webcomic! Will update weekly! Thank you for checking it out. Bookmark it and come back again! Run Of The Mill is an original web-comic by Eryck Webb started in October 31, 2014 following a fictional sotry about Eryck, a self-employed graphic artist, Kristina his supportive wife and their dog Wally, the curly haired occupant who thinks he wears the pants in the family. Day 30 sketch here at the end of the day after some evening livestream work. Great way to cool down while all loose and in the groove from working. Was feeling some Macintyre Gearwind art for this session. When I get to Season 3 - chapters 10 and beyond, we'll see more of Macs true colors. Right now everythings been pretty oblivious and ignorant due to him not telling Billy what he was really involved in, as well as Billy not telling him what he was doing with his free time (using his power goggles to super jump across the nation and attracting lots of unwanted attention). This is basicaly him, in his usual coveralls, tied down around his waste and he has dwarf bots 1 and 2 transformed into impact force neutralizing power gloves. It takes the toll off his shoulders/ body with counteracting any force put upon them or weight through various anti-gravity and other energy neutralizing methods. Though not meant to be heavy lifting, they do allow enhanced power in punching and hand to hand combat and optimum protection of hands and arms during full force blows. Also doubling as ideal blocking armor from nearly any blunt object or blade. Will also deflect normal bullets including impact energy. 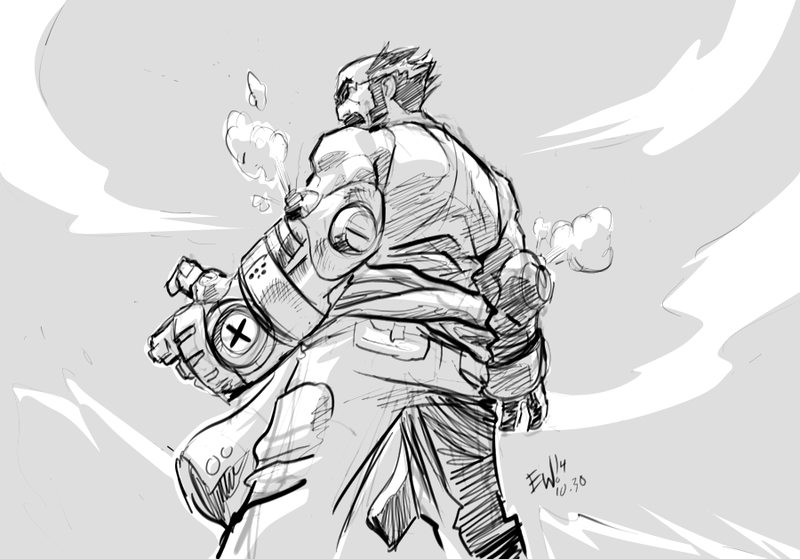 When not configured to his 1/2 punch gloves they turn back into two dwarf bots and go back about their business researching relics and maintaining the hq. There are 7 dwarf bots but only 1 and 2 turn into these. Remains to be seen what the other 5 can do. He assumes this posture when having to fight opponents, spar with marty or confront billy. Sketched with pen/ brushes in sketchbook pro and the gray shades added in photoshop. About 30 minutes start to finish. Can't believe tomorrow is the last day. but I've made a point to do one every day for warmup or disciplinary exercise! Well, for some, halloween trick or treating starts thursday, for some a few miles away its on saturday. and halloween is actualy friday. 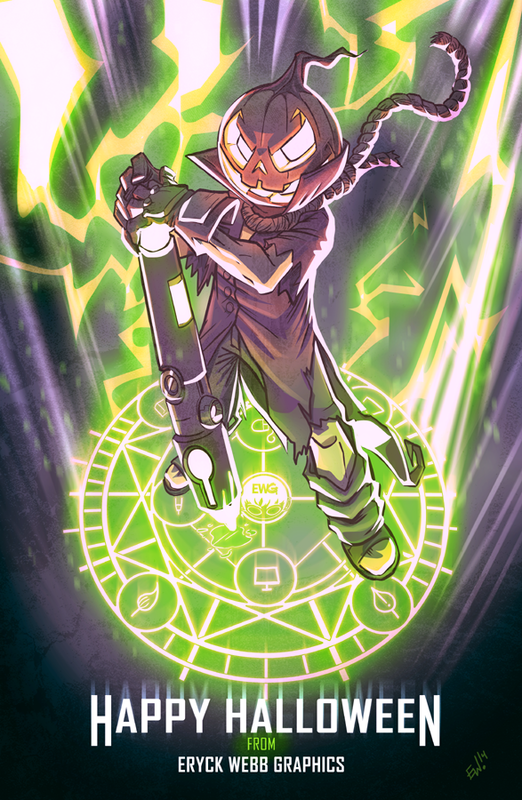 So i here by wish everyone a safe and fun halloween for the next 3 days :) Heres a little artwork to commemorate it. The EWG mascot 'Dewd' - one night a year he transforms into the Dewd O Lantern and with his magic wacom stylus to minister the dark graphic arts and render creations of pure evil! But they always disappear back to the nether world at sunrise after halloween! Happy Halloween everyone! A little something I was inspired to do this morning. Fall/ Halloween for me is always synonymous with Wizard of Oz. I always get in the mood to watch the original classic around around october/november and love it best waiting for it to be on TV - i dont know why, its more special that way than if i owned it. Though I guess I could just own it and only wait till that time of year and watch it when I'm really jonesing. REGARDLESS, this is something a long time coming. I may do this or a special DewdOLantern piece for halloween. Will finish it tonight/ by Halloween. And it will be available to purchase as an official EWG print. This piece is an new 2014 rendition of a classic personal piece I did way back in like early 2000s? Heres the old piece also availble to view on DeviantArt . This is me revisiting it as i've often wanted to do, and Inktober if nothing else is a great platform for me to take the time to do just that. Using my Inkscape inking tools over a sketch I did quickly in SKetchbookPro I just resketched and refined in black lineart/ with spot blacks then through a brown shade over to finish it off. I think it shows a massive improvement in form and skill since that original piece way back when. Today's inktober warmup got a bit outta hand. Spent wayyy more time on it then meant to originally but it was a lot of fun. Did it for the sister in law and her kids who are all about minecraft. 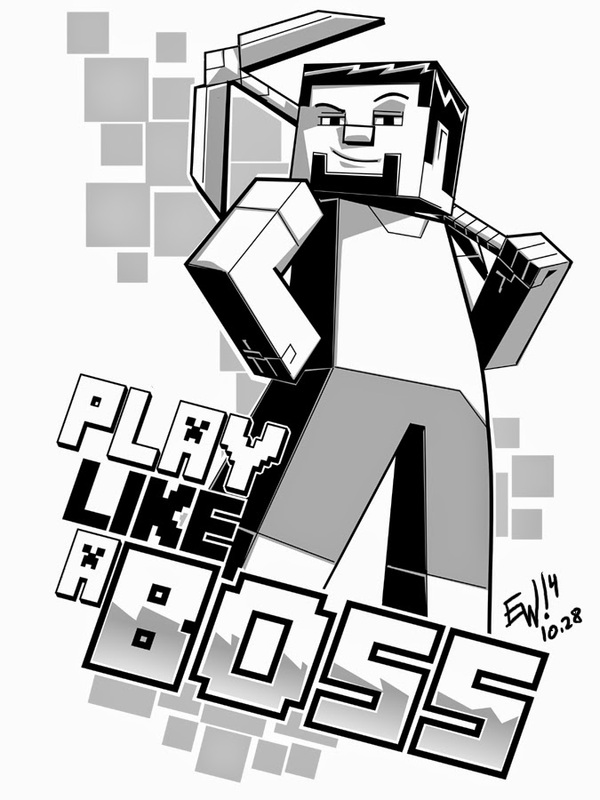 I did the minecraft in-game character look but simplified it/ changed a thing or two to make it more like maybe if it there was a cartoon version. Happy with how it came out. Fun stuff. Onto some work after lunch! Up late with the Artcasters tonight - was a really nice hangout talked bout a lotta really relavent stuff. Worked on today's two october orders while hanging. I think talking/ listening etc made it goe slower but I think these pieces are coming out pretty good if I say so myself. All I really have to do at this point is highlights and some final color tweaks and effects but its 2am. Time for bed! Will be picking it all up again in the morning after all! As always commissions are open for availability, check the gallery on this site and deviant art for examples and the pricelist to reference what you want. Email for custom quotes. Keep in mind for a steady income I buffer a few weeks ahead so all orders take 3-4 weeks to complete. Check order tracking to see status of current job invoices and october sale orders. Updated 5 days a week! Alright. I'm outtie, thanks again to the artcasters for inviting me out tonight. Happy to meet such a great group of likeminded individuals. On an end note. For mobile studio, drawing in photoshop/ sketchbook pro whilst on the road or in the kitchen table or at a park, what is the fastest, best pressure sensitivity and large screen size tablet to use thats not an apple or a wacom? The following is a dump of the Inktober sketches I did the last 5 days whilst on vacation but often was away from a proper computer or wifi access. Here you go! Have a super week! Will be out of the studio till after the weekend for a much needed vacation and 3 year anniversary with the wife. Take care of emails/ orders when I get back! Will however continue the Inktober entries via sketchbook pro on my phone (mini tablet?) with stylus and upload them. Look for them on twitter/ facebook rest of the week. #inktober #inktober2014 - Day 21 - After some tight and careful inking on a comic splash image tonight I thought it'd be fun to cool down with some pen sketching in Sketchbook Pro tonight. Well here it is. Must say came out far more realistic in the face and such than I meant to. 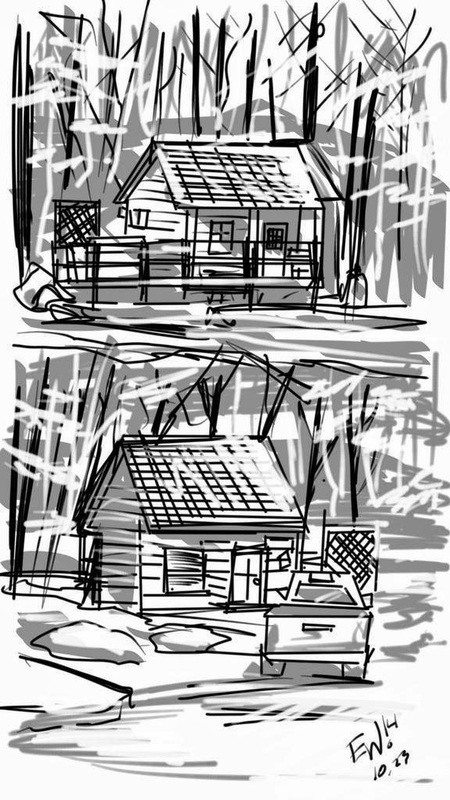 Sketching in Sketchbook Pro is really something, comes out awesome in most cases. The interface is like nothing Ive ever seen in any other art program. Very cool. This is my OC 'Sketch' - a hiphop/ artist character in the universe of JumpingBoy, my weekly webcomic (now on hiatus). He has a pen that will bring to life anything he draws once he signs it. It allows him to draw in 3d before his eyes and whatever his intention was while drawing it comes to life when its signed. The pen is also the only thing that can remove his signature/ make it break down again. Look forward very much to getting to use him in some stories soon! But for now, daz all - goodnight! 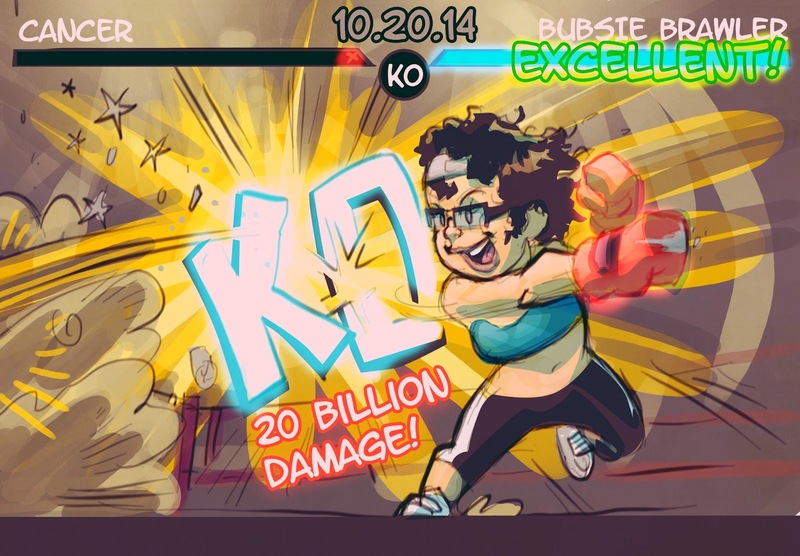 #cancerfree #cancer #braincancer #capcomvstatsunoko #fightinggame #KO - warmup this evening before working was inspired by today's trip to pittsburgh for her quarterly checkup, and the MRI came back great no change shes beaten this thing for another 4 months! Way to knock em dead bubsie! Alright fun personal work/ sketch, now onto some client work for a couple hours! 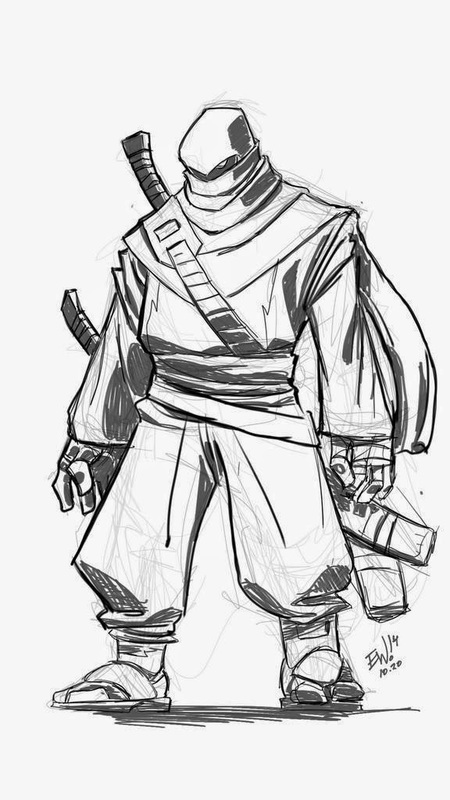 #inktober #inktober2014 - inktober day 20 sees a lgoptimus smartphone digital pen drawing of a ninja - inspired by joe mad ninja designs and sort of related to a comic commission im working on. 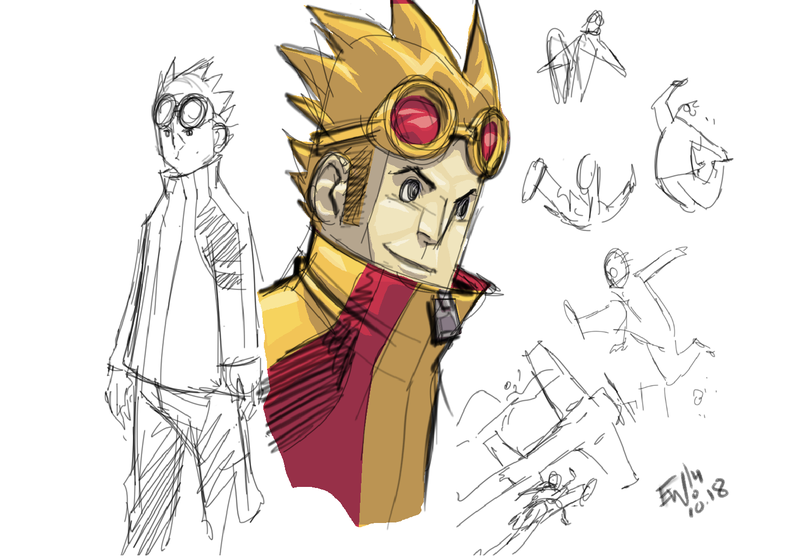 A quicky at the end o' the day here of The Javelin, an original character from my webcomic jumping boy. I goofed the date on the sketch it should be for 10.19 but sketched it out 10.20 here just after midnight. Oops, anyways its for day 19. Fun stuff. Goodnight! 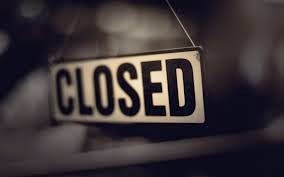 Will be working tomorrow evening and tuesday morning then will be out for the rest of the week. Any jobs in progress or clients looking for something to be done will be taken care of soon as I get back. But got a list of to-dos before that happens and will be available till early afternoon Tuesday by email/ instantmessenger of same name. Alrighty outtie! This was drawn in inkscape with light orange then inked and then shaded with the same ligh torange. Day 17 of Inktober will be this commission from the October MicroSale of Tenzin from Korra. His Halloween costume this year is dressing up/ portraying Stone Cold Steve Austin. The number represents season 4, and 2014. 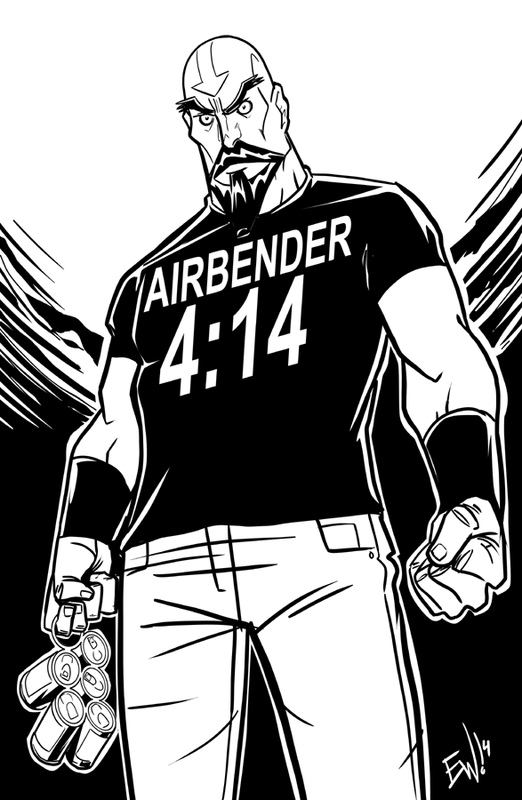 Instead of Austin 3:16 it is Airbender 4:14. Will be a busy production schedule the next 4 days or so so will be keeping Inktober simple or using inks of commissions to help get work done AND keep up with Inktober :) But yeah I'm kinda evolving into a new direction with my inks. I like where its headed. You can see it with this one and the Kylie Griffin ghostbusters pic I did during the sale tonight too. EVOluuuution. Have a great friday! Thanks so much for the great response to this sale, I'm really happy to be able to provide a service and product that folks get so excited about! Needless to say I will be busy the next couple weeks, but these will all be a lot of fun and I look forward to it! I'm shooting to have them done by November 1st but will have them done by November 7th at the latest! Thank you and goodnight! This event is now concluded! 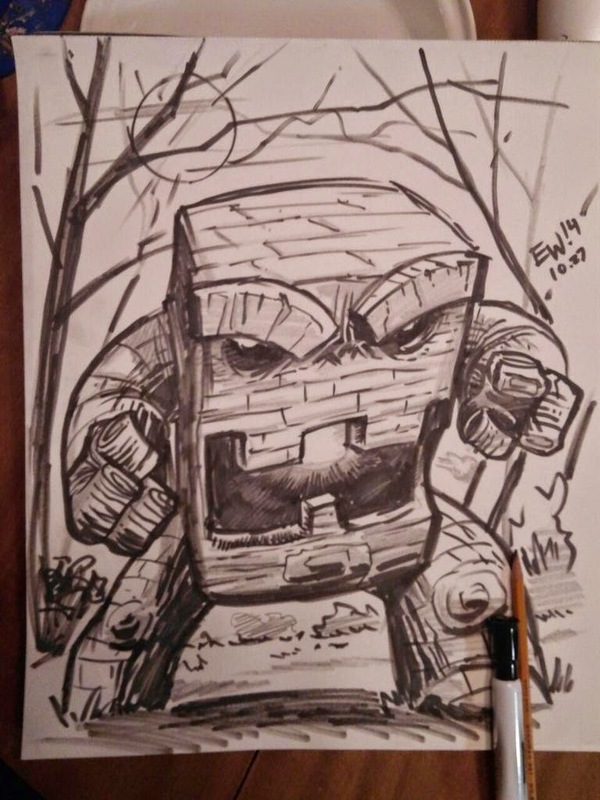 #inktober #inktober2014 #sketchbook #sketch #boom - working with a brush and marker in a free trial of Sketchbook Pro I downloaded while waiting for registry cleaning and malware scanning. Photoshop was acting up with program errors all in a row so I knew something changes. Not sure when/ where but its usualy from Malware being picked up. So ran SpyBot search and destroy and sho nuff, found stuff. And walla, after registry clean on a (surprise) photoshop related entry and some malware removal, restarted and photoshop worked long enough to let me finish saving out some new UTMNT pages and send to Nick! While waiting on all the scans and amidst helping the wife with a crazy exploding light bulb cleanup, I downloaded a demo for Sketchbook Pro which I did this sketch in, and a demo of Artweaver. Artweaver free edition lets you do way more. May become my solution for coloring if I ever decide to completely move from photoshop. Sketchbook Pro could easily be my go to as well. Gotta tell you I love the way it handles lines, pressure of the stylus and the overall feel drawing on it and the interface isn't too horrible. I just wish I could find a paint/ photoshop type program that had a Pen tool for outlineing and flatting and selecting areas. Thats my THINGGGG. I find the freehand lasso tool so archaic after using a pen tool in photoshop the last several years. So I'm on a hunt for a photoshop alternative soley for coloring and sketching. If anybody knows one that has a pen tool for selecting areas, and that lets you do layers and lock transparent shapes. I'm interested. So hit me up. Also officialy caught up on Inktober. Onto more inking, then a couple hours off before manning the helm of tonights October Micro Sale! Offer becomes live at 8pmEST and will close shop by 12amEST - earlier if no more orders come in. All orders will be done by November 6th. Normaly a 45-52 dollar value, get it for 30.00 during this sale. Went a little crazy with the blood effect haha. 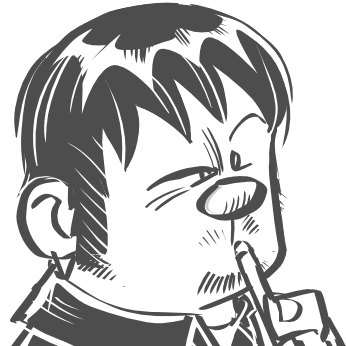 But I like how it came out with the 'Splotch' brush in inkscape. Forgot to do yesterday's so this is it and then will do today's later on! 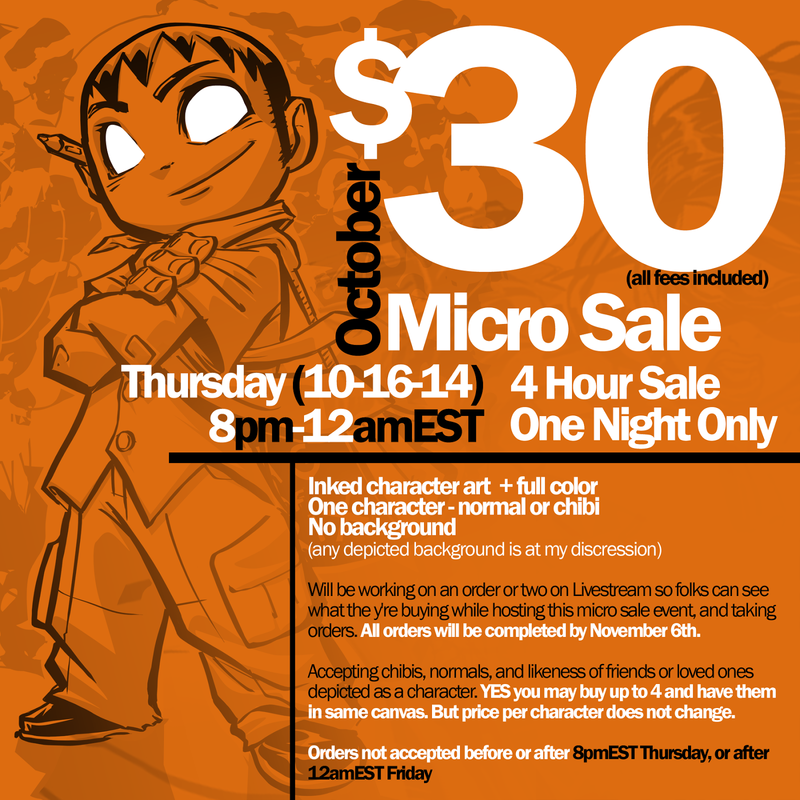 Maybe warmup before tonight's October Microsale Event! Between 8pmEST and 12amEST the offer is open to anybody on any site but I will be on Livestream recording the drawing of a piece or two to show examples of what folks are buying and providing a location to come out and talk to me/ ask questions etc. Looking forward to it! See you soon! Enjoyed a two-plus-hour hangout with fellow artists while we all worked on our respective projects or sketched. Talking about everything from comics to movies to our work. 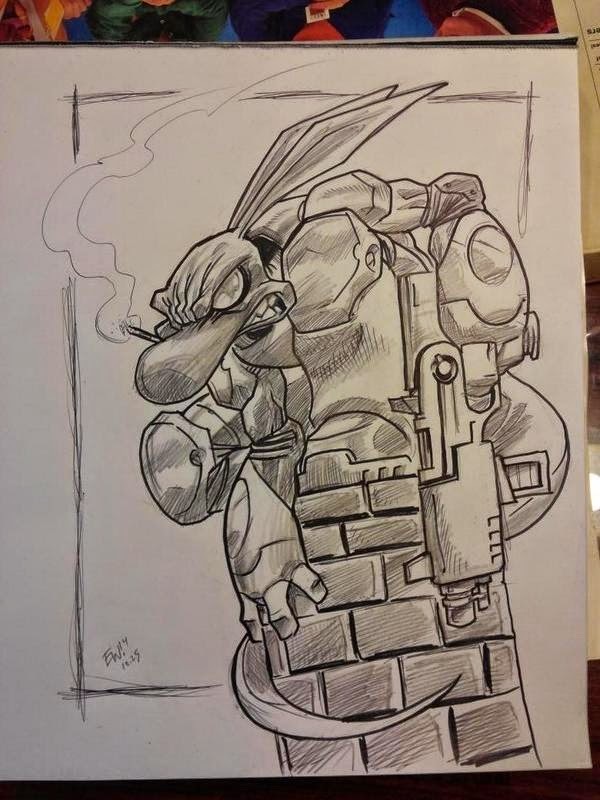 Check out Synergy 14 over on Peter Palmiotti's YouTube! 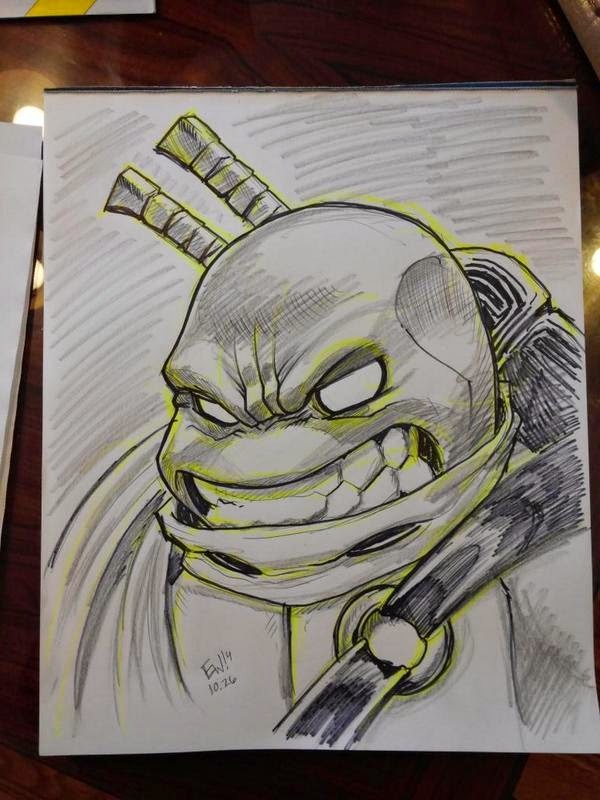 I'm the dude in the EWG orange 'BumpOnALog' hat drawing on ninja turtles pages. Leave a comment over on the video page. Thanks for checking it out! If it sounds like I'm talking without my nose its cause I got sinus stuff going on lol. See You Thursday! Thank you in advance! 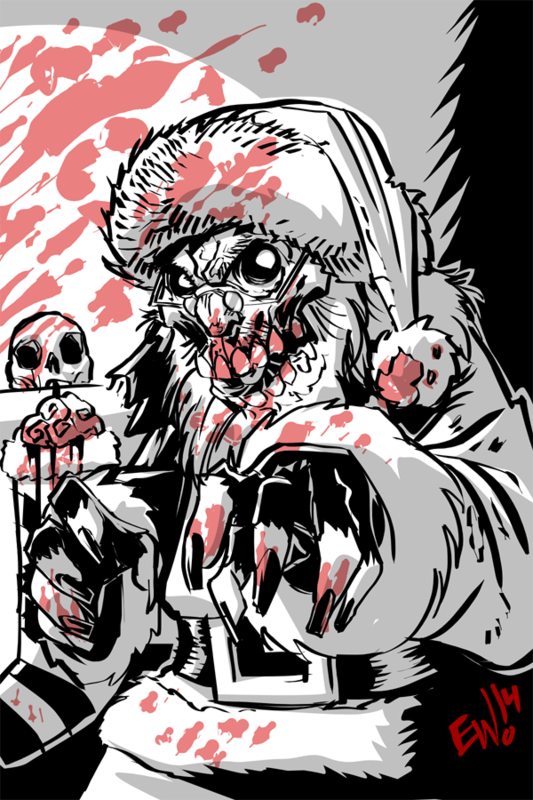 #inktober #inktober2014 #sketch #digitalinks Inktober Day 14! This time keepin it pretty straight forward with some Mean Muggin! Just a random muscular/ grimacy face with lots of loose shadow rendering. Had fun just goin freestyle and staying loose with the brush on this one and in the end used the white brush to clean it up a little here and there. Fun stuff. About 15 minutes start to fin just cause I got carried away with the strokes and 'details'. I originaly was trying to keep it a 5 minute exercise. Haha. Oops. 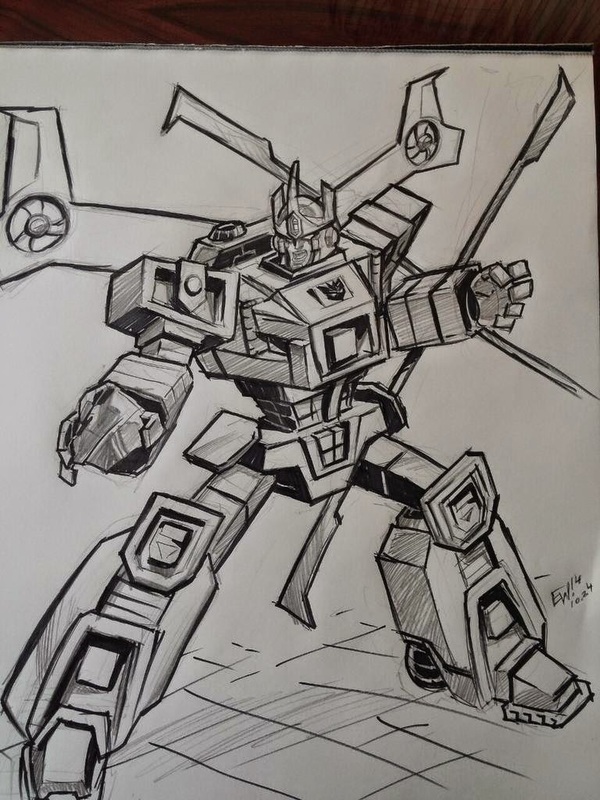 Great warmup to get the ol ink flowin and moving straight into some more Transformers page inks next! #inktober #inktober2014 #sketch #jumpingboy - Day 13 sees my original character from my webcomic series Jumping Boy enjoying some freefalling amongst the clouds with the ground far far below. Onto paid work rest of the day, but warmups like this always help workout the kinks that accumulate from long periods without drawing and getting the groove going again for the work week. 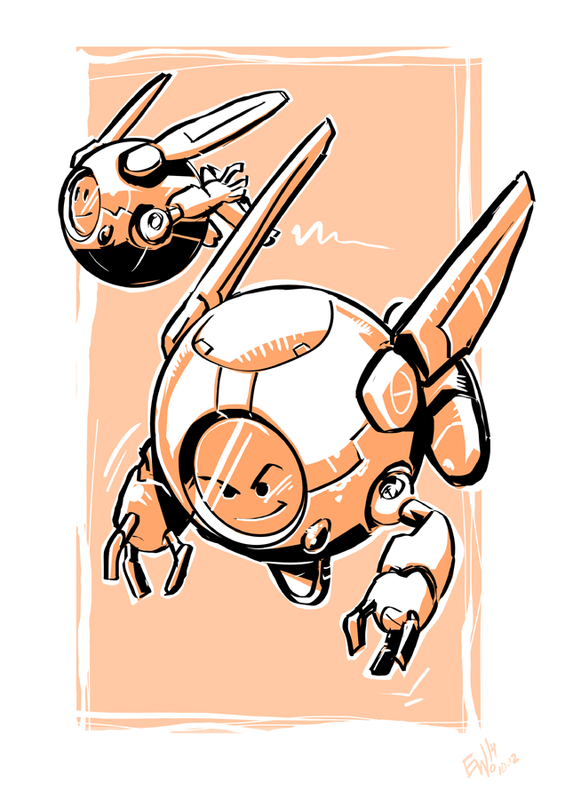 #inktober #inktober2014 - Day 12 featuring my original little robots behind the scenes the Dwarf Bots. Drawn in Inkscape! Goodnight folks! Day 11 - run of the mill - sort of a semi-anime-esque style of a property i'm looking to do more with very soon, Run Of The Mill. A fictional account of my self employed life as dictated by a authoritatiran dog. Fun stuff. 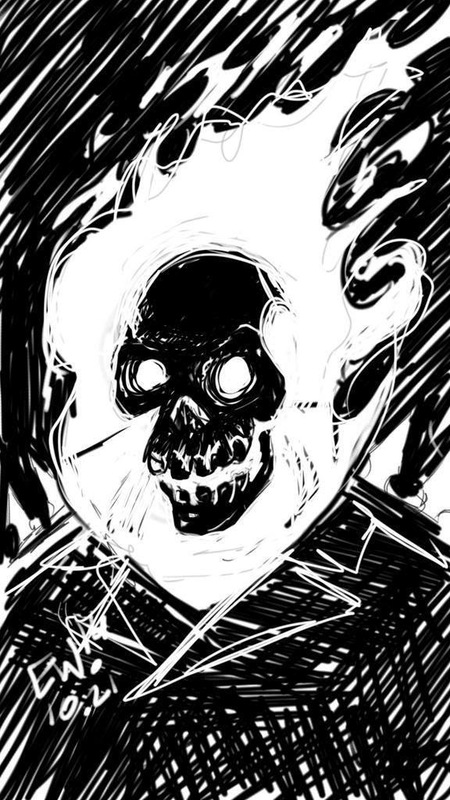 This was drawn on my LG Optimus phone in sketchbook mobile with a fiber tip stylus. #inktober #sketch Day 10 - A digitally inked piece of an original character i've always sorta kept in the back of my mind/ in sketchbooks - the ol scratchboard if you will but have never done much with. 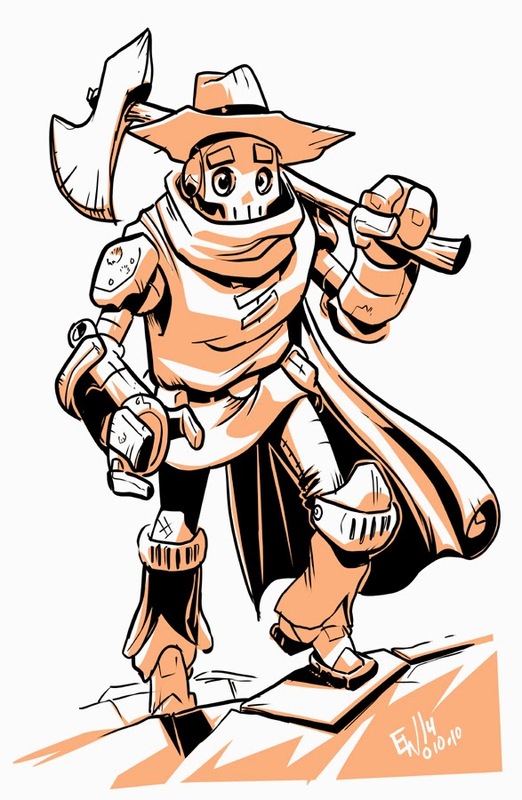 The mystery solving time traveling robot detective 'RoboGuise' - This time doing the medieval thing or something. Really kinda random haha. Enjoyed doing this on a portrait format monitor setup was a great pleasure to ink with its like working on a 11x17 paper but digital didnt have to zoom in hardly at all cause it was so large. Made the inks come out nice and crisp. The inks and the orange shades were all done in Inkscape. I'm seriously concidering moving to Inkscape for coloring as well now that I discovered it'll basicaly do muliply and screen settings on the layers. 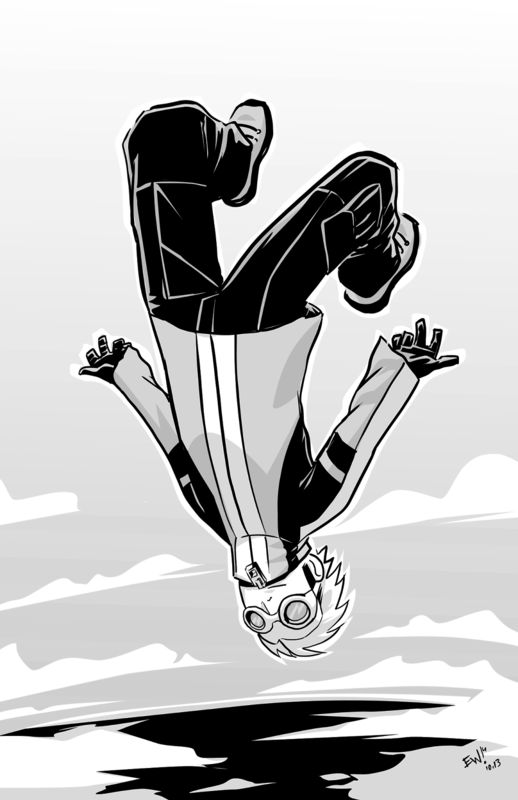 With the way photoshop is crashing lately and how fast efficient and freeing Inkscape is. Could be the future of EWG work, and the road to the next evolution of my quality and work flow. Day 10 down! Woot. Back to some more paid work this afternoon and then out for the weekend! #inktober #sketch Inktober - digital ink sketching my OC Jumping Boy - messing around with a diff costume I just sort of made up on the spot not really sold on it lol but thats the fun of experimenting with random design possibilities. Anywho! Try to think of something better for day 10. Werd! Drawn in Inkscape about 15 minutes. #inktober #sketch #characterart - today's Inktober installment is a quick digital inks sketch in Inkscape of my OC Bia - the frustrated warrior always overcompensating for her loss of her own arms with weaponized mech arms of mass destruction. But no matter how aggressive she is or powerful she gets she always manages to fall short of her goals. One might think perhaps shes not really doing something right or should be focusing herself down a different path since this one keeps not working out. It doesn't help that everytime she faces Jumping Boy she gets punted like a soccer ball. She has cybernetic prosthethics which can attach/ detach from mounted interfaces on her shoulders and with those cybernetic arms can attach the relic of force/power or the latest and greatest battle knuckles that Dr Baddman has built. The ultimate culmination is when she can manifest the oversized battle knuckles she knows and loves but via the near-invulnerable power of the relic bestowed to her. This will be a Bia jumping boy will have a hard time punting. This is a character design I created before I was ever aware of league of legends and Vi, the idea behind this was the proportion of a lean thin woman with huge arms/ hands that are the base for her attacks and fighting. The material is sturdy polymer with a kevlar-like casing that makes the battle knuckles incredibly durable but lighter than you might expect. They are also digitaly controlled and support themselves and counter balance eachother constantly so all she basicaly has to do is think about what she wants them to do and they act with her movement and thoughts. They are truely part of her and are wirelessly tapped into her nervous system. When Bia version 3 shows up, Jumping Boy will surely have his hands full! Inktober day 7 sketch! A cartoon of myself in the midst of some heavy decision making. About design options? Business ventures? What to have for lunch? Who knows! But day 7 is done! Woot woot. I try every month to have at least one Live sketch commission session on Livestream and in the past its been held on Thursday Nights as a special 'Thursday Night Livestream'. My question is, what night would be better? Or would folks prefer to see a day devoted to open stream/ table so that no matter what time zone your in, you can make it out to buy some art and see it drawn live? So, sound off here! All day Saturday 'table'? Or a 4-6 hour evening session on what evening of the week? Your input will help decide the format of the next Live Sketch event. Every opinion/ suggestion will be heavily considered! 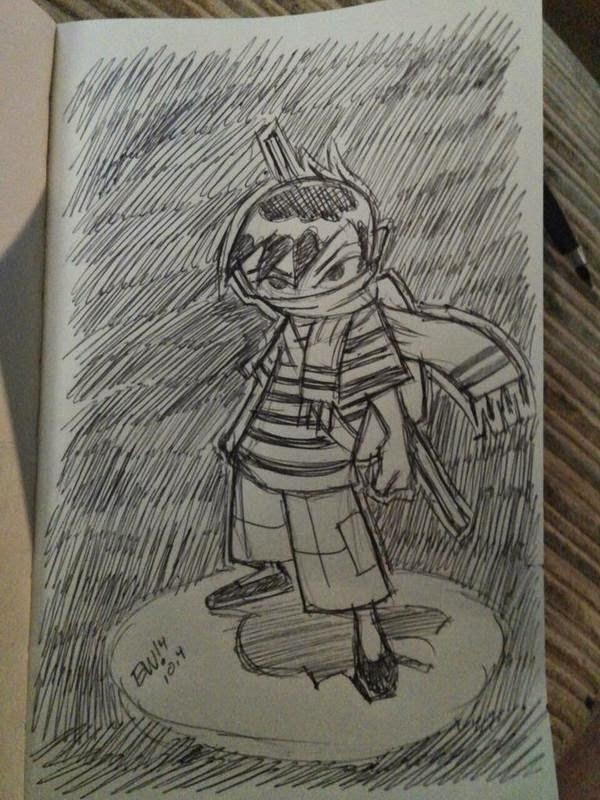 #inktober #sketch - Fearless Ninja for day 6! 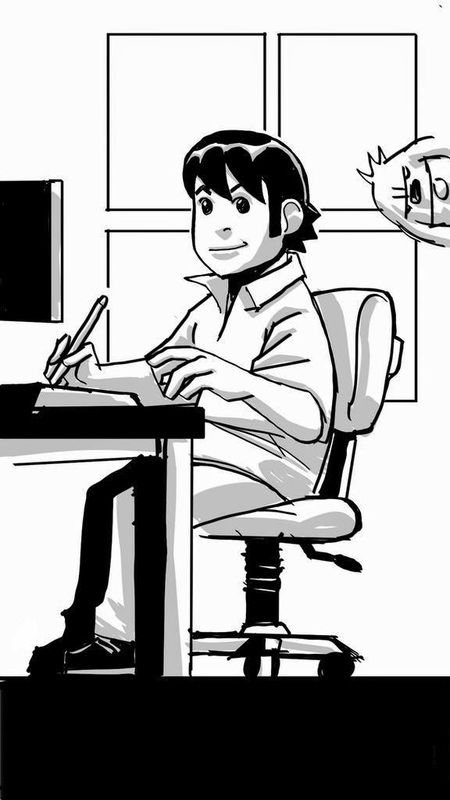 Sketched in Black and White via Inkscape while hanging out on Artcasters 11! I know I drew him on like day 2 but wanted to do a better one and I think I gotstit! Slots Closed this week. Lot on my plate and will be clearing it hard as I can all week. Look for them to open in up the next week or so! They're a blast and I will offer them every chance that I get. If nothing else, look for a live sketch night to tentatively happen the last week of the month. 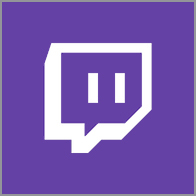 Would it be better to do per usual Thursday Night stream? Or do a all day Saturday session where the stream is open and table available for customers who want it during morning others who want it during afternoon and others during night? Depending on time zones? Sound off below. Did you plegde to the TnC kickstarter yet? Did you donate 100 dollars? Or just 1 - in all the excitement we lost count. Will you get all the goodies? Do you feel lucky?! Day 5 of this Inktober trek. Cory from TnCcomics.com doing his best Dirty Harry! Support the new Kickstarter for designing and publishing a collected book of year one, including bundles of exclusive prints, strips and covers! Slap down 5 bucks for a great series, here! This is my sketch from day 4, done with a ballpoint pen in my 8.5x5.5 sketchbook and took a photo with my phone to upload. Posted to twitter via phone yesterday but did not post it to my site. Now I have. Day 5 sketch coming shortly!